Thompson Hall is fundraising focus Deaf, deafblind and hard of hearing Minnesotans are rallying to raise funds for the Charles Thompson Memorial Hall in St Paul. The social hall, which is more than a century old, is the focus of a campaign to make the building handicapped-accessible. The hall is more than 100 years old. Its design, which includes large windows for ample natural light, is ideal for signing. It is on the National Register of Historic Places, and hosts a wide range of public and private events. But it isn’t accessible to people whose disabilities limit mobility. That has resulted in a decline in building use. 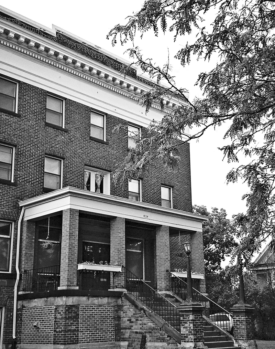 Deaf Equity Board members are working with the Thompson Hall Board of Trustees and community members to save the club, meeting since July 2017 to work on a renovation and preservation plan. The top priority is to add an elevator, which the building lacks now. The second is to preserve the building for future generations. The financial goal for the first phase of work is $130,000, to pay for planning and design. A second phase of work is needed for construction. Work done so far includes an elevator blueprint, a building assessment and historic structure report from the Minnesota Commission of the Deaf, DeafBlind and Hard of Hearing. Deaf-owned bank, Hiawatha National Bank in Hudson, Wisc. is providing banking services. An Eagan man who ran a network of personal care assistant services fraudulently obtained more than $4 million in Medicaid funds. A criminal complaint was filed in Ramsey County District Court in September, by the Minnesota Attorney General’s officer. Victor Nenghimobo Clement, 53, was already barred from participating as a Medicaid provider due to a previous conviction in Ramsey County for Medicaid fraud. In the current case, an investigation by the state’s Medicaid Fraud Control Unit found that Clement arranged for others to start personal care attendant (PCA) agencies. The criminal complaint states that he managed the agencies. He also worked with others to set up four more “shell” companies to conceal stolen funds. Clement is charged with racketeering between 2012 and 2015, three counts of aiding and abetting theft by false representation, four counts of aiding and abetting theft by swindle, six counts of concealing criminal proceeds, and four counts of engaging in business of concealing criminal proceeds. In the past felony case, Clement was to pay $75,000 in restitution to the Minnesota Department of Human Services (DHS). But it was found that he used stolen fund to repay more than $49,000. “What makes this case especially troubling is that this individual was barred from participation in the Medical Assistance program,” said Attorney General Lori Swanson. Dedra Fayatte Wilson, 29, of Newport; Inemo Seimokuma Clement, 55, of Tacoma, Wash.; Amiete Priscillia Clement, 47, of Eagan; Janaei Jatuan Reed, 30, of Woodbury; and Theresa Ann Jordan, 45, of Blaine are also charged. After Victor Clement’s previous company came under investigation, he operated other agencies out of a building on St. Paul’s University Avenue: AppleOne Home Care Services Inc., Ambitious Care Services Inc., Blessing Home Health Services Inc. and Human Services Associates Inc., according to the investigation. The agencies obtained nearly $3.9 million from DHS for services that were not eligible for reimbursement because Clement was an excluded provider. Also, the agencies billed DHS for at least $248,000 in PCA services that did not occur, the complaint said. Though the businesses didn’t disclose to DHS that Clement was involved in running them, the investigation turned up evidence. Business records seized from Clement’s house included paystubs that named Clement as the corporate officer of AppleOne. Clement listed AppleOne as his employer from “2010-now” when he completed an application to rent an apartment in 2012. Email addresses linked to the companies were connected to Clement’s LinkedIn page and cellphone. A disproportionate number of residents who receive state assistance because they are disabled and low-income has the city of South St. Paul seeking aid from Dakota County. The South St. Paul City Council drafted a resolution in late August asking for help in alleviating what they say is a strain on city resources caused by too many police calls, some from disabled people who are part of housing support programs. Dakota County officials began looking at the request in September. County officials also worry about unfair stereotyping of people with disabilities. The city wants the county to provide “an experienced social worker” to be housed at the police department. It’s also asking for revisions to how the county’s 911 dispatch center is funded so that the county levy covers the cost. The request was sparked by the shooting of two South St. Paul police officers in July. The man charged in the shooting was receiving state services at the time for his disability. City Council Member Todd Podgorski said he’s heard about high numbers of 911 calls for years, but the July incident spurred him to act. County officials said they were already responding to the city’s concerns when the resolution was drafted. They recently pledged to hire a mental health coordinator to be shared by the West St. Paul and South St. Paul police departments. The county is also tracking the people who make frequent 911 calls and trying to determine why they’re calling so often. Dakota County Commissioner Kathleen Gaylord said there may be other reasons for the higher number of calls. South St. Paul is an aging community, she said, and older people may be calling more for medical assistance. Podgorski, who is running against Gaylord for her commission seat, said the county’s efforts aren’t enough. “It’s disappointing that it took such a critical incident to have them respond more appropriately,” he said. Wheelchair users have won a two-year campaign to add an $11,000 track-chair for visitors at Rochester’s Quarry Hill Nature Park. The tank-like vehicle is expected to open up and make more areas of the 329-acre park accessible to wheelchair users. Rochester resident Noah Hanson is one of the people who pushed for the new vehicle. As a Century High School student and member of Rochester-Olmsted County Youth Commission, Hanson was part of an effort to clear invasive species from the park. He got stuck on a gravel road and had to call for help. Hanson and Mary Gorfine, the youth commission’s coordinator, launched the campaign to purchase the chair and make parks more accessible. Hanson had used a track-chair at a center in Stewartville. Rochester City Council Member Ed Hruska met the two by chance and quickly got involved. The chair is the first for Rochester parks and may be used at other city parks. Olmsted County has two track-chairs for its parks. Minneapolis Public Schools, which has one of the state’s largest special education programs, is struggling with vacancies in teaching and assistant positions. The shortfall in Minneapolis, Superintendent Ed Graff said, stems from the strong labor market and a high number of assistants leaving the job just before schools opened this year. Minneapolis began the new school year with fewer than 10 special education teacher vacancies, a significant improvement from previous years. But Graff said he is concerned about vacancies among assistants, especially in high schools that serve students with severe learning disabilities. In the past several years, the number of Minnesota students needing special education services has soared, while the shortage of teachers and aides to instruct them has become more pronounced, according to a 2017 report released by the state Department of Education. Almost all states across the nation are struggling with shortages in special education staff. “Our intent is to get those filled as quickly as possible with the same level of high quality staff we’d be pursuing throughout the course of the school year,” Graff recently told the Minneapolis But while the VA was cited for these failures, the investigating team was unable to determine that any one issue, or some combination, caused the patient’s death. The report notes the rate of suicide by veterans exceeds that of U.S. civilian adult males — 37.2 per 100,000 for veterans compared to 25 per 100,000 for civilian adult males. In 2014, the number of veteran deaths by suicide averaged 20 a day, according to the Veterans Health Administration. In 2007, the VA established a suicide prevention hotline in an effort to provide emotional support and intervention to veterans and their friends and families. Collaboration among health care professionals and treatment teams is a key in improving health care and patient safety, the report noted. According to the Inspector General’s report, the veteran in this case called the crisis line, reporting suicidal thoughts and having “immediate access to guns.” The crisis worker and the veteran, who isn’t identified in the report, developed a safety plan that included going to the VA’s emergency department. According to the report, the patient described feeling hopeful, and the discharge summary said the patient was a low risk for suicide. The veteran denied having immediate access to a firearm but said he could obtain one.